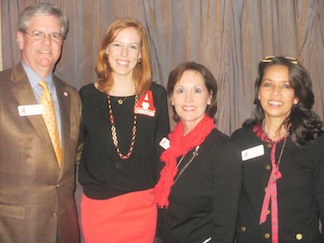 Chapter members hosted several University VIPs to celebrate the holidays. NEW YORK -- It was a family affair once again as an intimate crowd of nearly 50 Alabama alumni and University dignitaries celebrated the holidays at the 2012 Greater New York Chapter Annual Holiday Party. For the fourth-straight year, Silverleaf Tavern in midtown Manhattan served as the backdrop for chapter members to celebrate the festive season and offer another chance to revel in the Crimson Tide's win in the SEC Football Championship Game. Calvin Brown, the University's Director of Alumni Affairs, addressed the crowd with updates from the Capstone and Sabrina Skelton Keating took a few minutes to share her experiences visiting alumni chapters, especially UANYC, as National Alumni Association President. "It's been a wonderful experience because I've been able to visit with alumni chapters around the country," said Keating. "I call these visits 'family reunions' because tonight is like meeting the New York branch of the family. We're like-minded and we share a love for the University of Alabama. "The reputation of the Greater New York Chapter has always been one of enthusiasm, hard work, promoting the University and also having a good time. It's one of the most important chapters in our network of chapters. So I knew the chapter by reputation until this week. Now that I've been here, this chapter has exceeded everything that I've heard and known. This chapter is just the tops." The chapter topped the evening with a raffle featuring prizes donated by Corey Gibbs of Ticket Solutions, Inc. and Dennis Bogart of the Paige Hospitality Group. Kristie Gibbs ('98) won the Greg McElroy autographed football, Clay Brasher ('06) was selected for two tickets to either the Arkansas or Ole Miss game in 2013 and Jim Sammartino, father of two Alabama graduates (Julie and Peter), took home a $200 gift certificate from The Ainsworth.